Have fun with your kids this winter. Six winter activities for families to enjoy together. Most of them will help get you outdoors, but there are a few indoor activities for those really cold days. Last Monday we woke up to find that snow had transformed the landscape into a winter wonderland. My inner child still delights in that first snowfall each year. There is something magical about the transformation and when the sun shines it is absolutely beautiful. Winter in northern climes can be challenging. Winter comes early and leaves late. Still snow is a lot of fun when you don’t have to shovel it! If the temperatures aren’t too frigid, bundle up the family and head outside for some winter fun together. It time for some awesome winter activities! 1. Snow Painting Happy Hooligans describes how to have fun painting the snow. You could make a snow man and add some color! 3. Paper Snowflakes Remember making paper snowflakes as a kid? This tutorial at Frugal Fun For Boys tells you everything you need to know to create gorgeous snowflakes. Where will you display your collection? 4. Examining Snowflakes Teach Preschool has some simple instructions to help you examine snowflakes. If you don’t get much snow you can see some truly breathtaking pictures of snowflakes here. 5. Bird Feeders Winter can be very challenging for our feathered friends, especially when it is very cold and food is scarce. This post from Crafty Crow lists some wonderful ways of feeding the birds. Ideas include bird food wreath, bird seed ornaments, and bird food garlands. What are your favorite winter activities? What helps you to embrace the season and enjoy the snow? 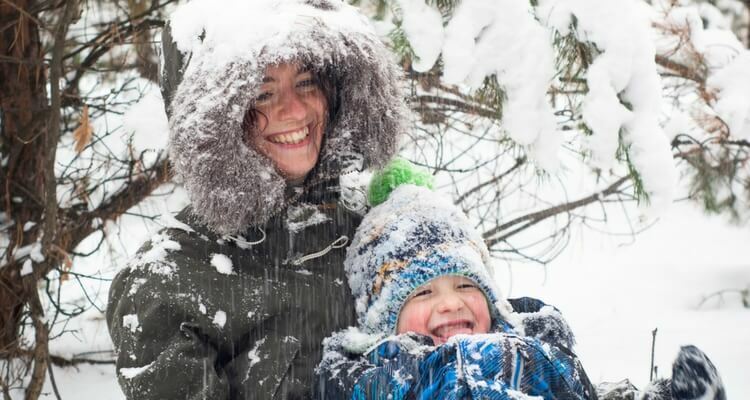 How do your children respond to the first snowfall of the winter? Follow Rediscovered Families’s board Winter Fun on Pinterest. I loved this post! I pinned it to my “parenting” board on Pinterest. This is a fun post! I especially like the bird feeder ideas. The birds become the only color we see in the winter when the flowers are dormant. It is fun to watch them through the window! I love watching the birds too. They do brighten up the yard and it is fun to see their antics. Me too!! Me tooo! They are so pretty and as we approach the winter solstice we need all the light we can get! I’m stopping by from Family Fridays link up. Such neat ideas that I had never thought of. 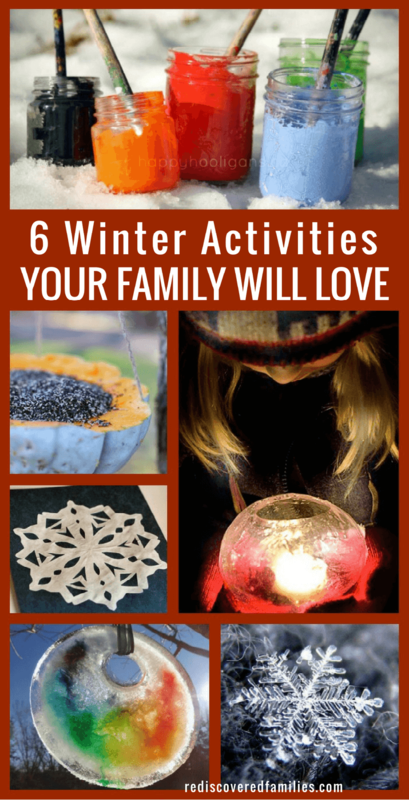 I love getting us outdoors even in winter and these ideas will be a part of that this year! Pinning! Thank you so much. I hope you get a chance to enjoy some of these activities. Thank you for linking up to Family Friday. I love the bird feeder idea. My little guy is in love with cardinals, and that would be a fun project for him. Missy Homemaker recently posted…Saturday Soapbox: Food Stamps Cuts…oh SNAP! I love Cardinals too! They are such a burst of color in all the white. thanks for collecting these! i’m excited to do the sun catchers with the kids – SO pretty!! The sun catcher is my favorite too! Carli recently posted…How To Peel A Whole Head Of Garlic In Less Than 10 Seconds! Welcome Carli, thanks for visiting. I love that picture and quote from L.Carrol!